Categories: Love, Mother's Day, Swami Vivekananda. All Mahans – great yogis, jnanis and bhaktas who renounced the whole world for spiritual prowess, for Self-Knowledge, for the sake of their Lord – have nevertheless had a soft corner for their mothers. Sri Adi Shankara, the great Jnani and proponent of Advaita, came back to his mother at the time of her death and shed profuse tears of grief at her passing! Sri Ramana Maharshi, the great sage who had no possessions, maintained no relationships and was beyond the four ashramas, had a special relationship with his mother who lived with him in her later years, and eventually became a ‘mother’ to all his devotees and disciples too. Likewise, Swami Vivekananda too had a special relationship with his mother. Swami Vivekananda’s mother, Bhuvaneshwari Devi was a strong, pious woman who had to face numerous struggles in her life: After the death of her husband, when her oldest son Naren (Swami Vivekananda) was barely 20, she was cheated of her rightful property by relatives. One who was accustomed to opulence and comfortable living was now forced, along with her children, to move out of her house and live with her mother in what Swamiji later called “a hovel”. She was financially in very poor condition, and continued to struggle with the court case and property dispute for her rightful home for a large part of her life. 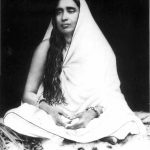 Not long after her husband’s passing, Bhuvaneshwari Devi had to reluctantly let go of her eldest and favorite son, Naren, who left his home to pursue spiritual sadhana and take care of his ailing Master, Sri Ramakrishna, and later renouncing the world, took up sanyasa. Years later, Bhuvaneshwari Devi also had to undergo terrible grief through her daughter’s suicide and later see her great son, Swami Vivekananda, leave his mortal coil much before her own time. Yet through all this, Bhuvaneshwari Devi remained patient and calm, and maintained her dignity, strength, piety and righteousness, while performing her duties with a steady mind. Whenever Swamiji was in Calcutta, he would often visit his mother, and she too would go to see him. Swamiji returned to India in late 1900 with his health taking a turn for the worse. But yet he did not abandon any of the duties that he considered sacred. He continued to visit his mother and tried to solve her family affairs as best as he could. He also did his best to fulfill his devotion to his mother through doing things close to her spiritual heart. He performed pujas at his mother’s house. 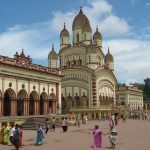 He fulfilled his mother’s wish of completing her old vow at the Kali temple of Kalighat near Calcutta and performed all the necessary rituals there. Despite his bad health, he took her on a pilgrimage to many places in East Bengal in 1901, just to fulfill her desire to go on a pilgrimage with him. Swami Vivekananda’s Master, Sri Ramakrishna Paramahamsa, saw all women as the Divine Mother. For him, SHE was everything! What better way to glorify the “Mother” on Mother’s Day than to reminisce Swami Vivekananda’s love for his own mother, on the occasion of his 150th birth year celebrations? 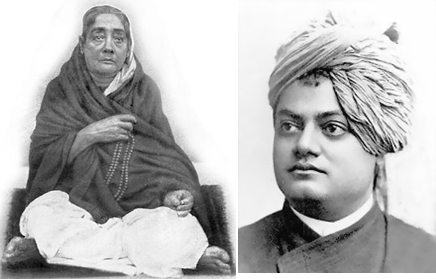 9 Responses to "Swami Vivekananda’s Love for His Mother"
Beautiful article. Maybe she is the Bhuvaneshwari Amman we worship near Premika Bhavanam. :). Prostrations at her Lotus Feet. One of the most pure and greatest messages.I bow in reverence to Swamiji and his powerful thought on Motherhood. This shows the love & respect Swamiji had for his mother. Both are blessed souls. Swamiji has inspired millions & continues to do so. both bhubaneshwari devi and ma sarada were lucky because swamiji was their son. Got message to be pure from within and outside which results in good colors. My full respect for the great sage of world and his beloved Mother Bhubaneswari Devi, I bow down with respect for them. I bow down with respect towards them. If any girl want to born a boy like a Swami Vivekananda she should have purest heart. 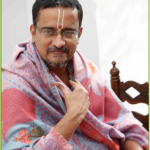 It is necessary to leave home and renunciation of attachments dearest to you to perform true spiritual saadhana and revoke your soul or yourself to higher level.